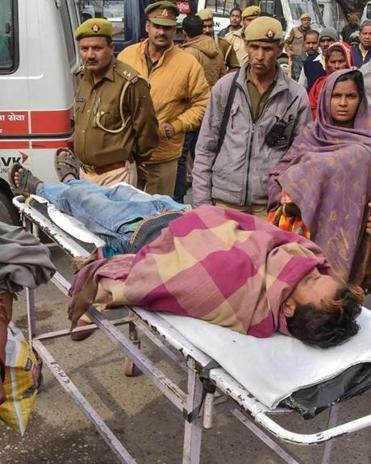 An Indian man was taken on a stretcher to Saharanpur Civil Hospital on Sunday after getting sick from toxic locally made alcohol in Saharanpur in the northern state of Uttar Pradesh. Last weekend, Pintu Kumar, a farmhand in northern India, went to a friend’s memorial service. On the way back to his village, he bought dozens of small plastic pouches of homemade alcohol. They were not labeled — they usually aren’t — but the alcohol was incredibly strong and cheap, at about 40 cents per pouch. It was also unusually milky in color and smelled like diesel fuel. But that did not stop Kumar from tearing holes in a couple of pouches and sharing them with his friends. In the past few days, a poisonous batch of illegal homemade alcohol has killed as many as 100 people in northern India. The deaths, which have rattled the country and become front-page news, prompted authorities to crack down on underground brewers, arresting more than 3,000 suspects and seizing tens of thousands of gallons of illicit alcohol. Indian officials say they have traced the poisonous batch to a criminal enterprise that brews thousands of pouches of illicit alcohol in an underground factory hidden in the forest in Uttarakhand state. The kingpin, they say, is on the run. Politicians gearing up for national elections in the coming months have been quick to seize on this disaster and blame each other. Priyanka Gandhi Vadra, an official for the Indian National Congress party and the latest member of the Gandhi dynasty to jump into politics, said it was “unimaginable” that this could happen “on such a large scale under the patronage of the Uttarakhand and Uttar Pradesh governments,” two states controlled by the rival Bharatiya Janata Party. Most of the deaths were in a border area straddling those two states. Many villagers have vented their fury at police officers, whom they accuse of taking bribes from bootleggers to look the other way while dangerous illegal brews are sold openly along the roads and in markets. Poisonous homemade alcohol is a problem in India, particularly among the poor. Hundreds die each year from consuming it. In 2015, at least 100 people in a Mumbai-area slum were killed, and in 2008, in one of the largest incidents of this kind in recent decades, more than 170 people died after drinking an illicit home brew in slum areas of Karnataka and Tamil Nadu. The appeal of illegal liquor is that it is cheap and potent, often far more potent than what is sold in stores. Two of India’s larger states, Gujarat and Bihar, are dry — though in both places, a vibrant, scarcely concealed bootleg industry thrives. On Monday, protesters crammed the streets of Saharanpur, a city in Uttar Pradesh where authorities said about 60 people had died after drinking bad alcohol. Arvis Lambha, a local activist with the Bhim Army, a volunteer group working for the welfare of Dalits, a marginalized community among Hindus, said the hospitals in his area had completely failed. Haresh Rawat, the former chief minister of Uttarakhand, blamed organized crime for the disaster. The alcohol seems to have been distributed over the weekend, with many people starting to die Saturday. Several witnesses said it was cloudier than usual and smelled bad. Illegal home brew is often referred to as “desi daru,” which means “indigenous alcohol” and refers to traditional legal brews as well. The illegal varieties are often laced with methanol, a flammable liquid used as a fuel that can lead to blindness or death when ingested. The Uttar Pradesh police services have suspended several officers on suspicion of allowing the illicit alcohol to cross state lines.